The International Air Transport Association (IATA) announced that demand for air travel recorded another solid month of growth in July. 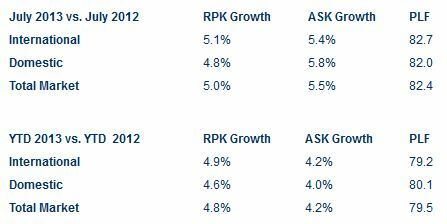 Overall revenue passenger kilometers (RPKs) were up 5.0% compared to July 2012. All regions were up year-on-year, with emerging markets recording the strongest increases.. Capacity rose 5.5% on the previous July, ahead of demand, and industry load factor dropped 0.4 percentage points to 82.4%. Although July’s 5.0% performance was not as strong as June’s (6.1%), this likely reflects both a market correction in line with prevailing economic conditions as well as the impact of reduced travel in markets observing the Ramadan period. “Passenger demand continues to be strong. But the story of emerging markets driving growth as developed economies stagnate could be shifting. We are still expecting growth of 5% this year. How that growth is achieved, however, appears to be at a turning point,” said Tony Tyler, IATA’s Director General and CEO. “The emergence of the Eurozone from an 18-month recession provided the biggest boost to traffic over recent months. In contrast, the deceleration of the Chinese economy has been a dampener on air travel, with weakness showing up throughout emerging Asian markets. The price of oil, a huge cost item for airlines, is tracking political tensions in the Middle East. Along with the global cost impact of this, at the regional level there is the potential for disruption for one of aviation’s strongest and most consistent growth markets,” said Tyler. July international passenger traffic climbed 5.1% compared to the year-ago period. Capacity rose slightly faster at 5.4%, causing load factor to slip 0.2 percentage points to 82.7%. Performance across all regions was positive. Asia-Pacific carriers’ July traffic was up 6.3% on a year ago. Capacity rose 6.6% and load factor dipped 0.2 points to 79.5%. The support for growth at this rate is weakening. The region’s largest economy—China—continued to decelerate in the second quarter. With trade volumes in emerging Asian markets shrinking by almost 5% over the first half of the year, the softness is not isolated to China. In particular, India’s near term growth prospects are looking bleak. For the year we would expect performance to even-out around the 4.1% growth achieved year-to-date. European carriers recorded a 3.7% increase in demand compared to July 2012, in line with year-to-date growth although a significant decline compared to June results (5.3%). The Eurozone emerged from its 18-month recession during the second quarter, giving grounds for cautious optimism for the region’s performance in the second half tempered by significant variations by country. Capacity rose 3.6% and load factor improved marginally to 85.5%. North American airlines’ international traffic rose 3.6% in July versus the same month last year, while capacity climbed 2.9%, pushing load factor up 0.6 percentage points to 87.4%, highest for any region. Latest indicators show July business confidence reaching levels not seen since March, with consumer confidence also showing improvement at the end of the second quarter. Middle East carriers experienced the highest growth rate for any region, with July traffic up 7.8% compared to a year ago. While this is a fall-off from even higher year-over-year growth in June (12.1%), part of the decline can be attributed to the timing of Ramadan, which has a dampening effect on demand. In 2013 Ramadan spanned most of July whereas in 2012, it occurred mostly in August. Capacity growth of 10.5% sent load factors down two percentage points to 78.3%. Latin American airlines posted year-on-year demand growth of 7.3% almost perfectly aligned with capacity growth of 7.4%. The load factor slipped 0.1 percentage points to 82.4%, slightly below the industry average. Although Brazil continues to see inflation rising and domestic demand weakening, this is being partly offset by strong expansion in Chile and Colombia. African airlines’ traffic climbed 7.5% compared to July 2012, second best among the regions, while capacity rose 5.6%, boosting load factor 1.3 percentage points to 73.6%, still the lowest among the regions. Expansion in trade is driving the healthy rise in demand for air travel on the continent. With the exception of Brazil all domestic markets experienced demand growth in July, but rates among countries varied significantly. Total traffic climbed 4.8% but this was exceeded by a 5.8% rise in capacity and load factor slipped to 82%. China’s domestic traffic climbed 10.7% compared to July 2012. Although this was second best, it reflected a slowdown from the 14.5% year-over-year growth recorded in June and suggests China’s air travel market may be showing its first signs of weakness. Capacity rose 14.3%, and load factor fell 2.6 percentage points to 80.9%. The US domestic market was up 1.5% in July compared to a year ago, a decline on the 2.4% growth in June and below the year-to-date average of 1.9% which reflected stronger growth before the impact of government spending cuts. Capacity rose 2.2% and load factor dipped 0.6 percentage points but still led the industry at 86.6%. Japan’s domestic market had another month of strong growth, with demand up 5.7%, reflecting stronger economic performance. Capacity rose 7.1% and load factor dipped slightly to 60.3%. Brazil saw July traffic fall 0.6%, the only market to experience a decline; and with mounting inflation pressures, the outlook for consumer demand is fragile. Capacity rose 0.5% and load factor fell 0.8 percentage points to 79%. Russia experienced the strongest growth, with domestic traffic up 11.9% over July 2012, up from June year-on-year growth of 9.8%. However, July business activity indicators show a decline compared to June in both the manufacturing and services sectors that could impact demand. Australian domestic air travel increased 4.5% in July compared to a year ago, slightly up on growth of 3.7% in June but below the 5%-plus growth rate of 2012. This slower pace is expected to continue in line with downward revisions to GDP growth owing to tepid performance of major trading partners China and India. Capacity rose 1.8%. “Economic growth and connectivity go hand in hand. Indeed, connectivity creates jobs and supports growth. So it is for good reason that the long-term sustainability of aviation will be high on the agenda when governments meet in Montreal at the end of this month for the 38th Assembly of the International Civil Aviation Organization (ICAO). The aviation industry is committed to addressing its climate change impact including the challenging target of carbon-neutral growth from 2020 (CNG2020). Governments set the same goal when they last met. So this Assembly is a golden opportunity to reach a global consensus by governments on how to achieve this goal efficiently,” said Tyler. In June, IATA’s 240 member airlines supported a resolution calling on governments to reach a global agreement on a market-based measure (MBM) as a key tool to manage aviation’s carbon footprint and achieve the industry’s carbon-neutral growth target. Industry and governments must work together firstly on key measures to maximize the impact of improved technology, operations and infrastructure on aviation’s carbon footprint. An MBM would act as a complementary measure to enable the industry to meet the CNG2020 target. Specifically, the resolution supports a single mandatory carbon offset scheme as the simplest and most efficient MBM to implement. It also sets out key principles for the fair implementation of MBMs. “Aviation is about growing connectivity and all the economic and social benefits it enables. Sustainability is a core part of this vision. We are doing all we can to support fully the success of governments in agreeing an aviation solution for sustainability that is global and which will underpin the future development of our important industry,” said Tyler.